Home » St Patrick » Trinity » St. Patrick Mobile - Color, Cut, Glue, and Create! 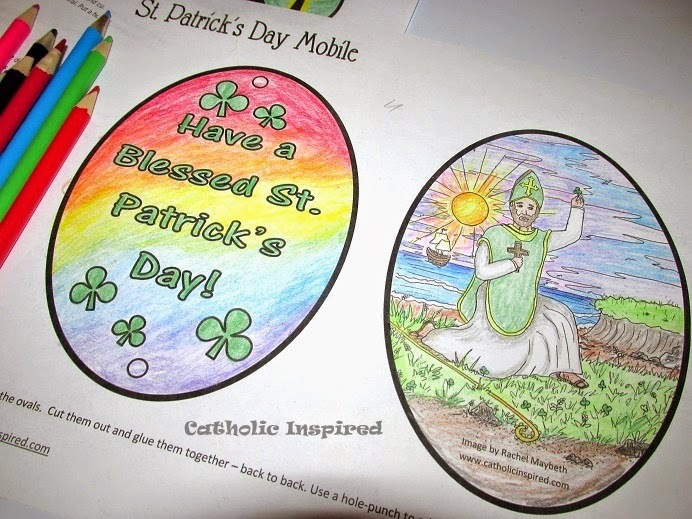 St. Patrick Mobile - Color, Cut, Glue, and Create! The March winds are here! 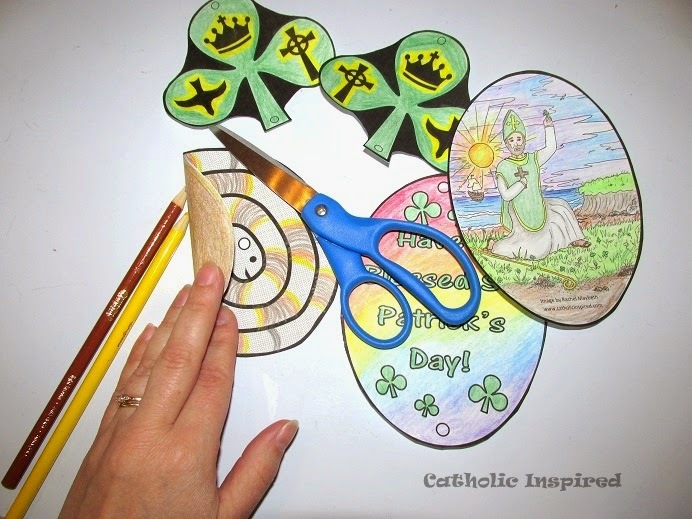 So for Saint Patrick's feast day I made a fun project that can spin in the cool Spring winds. 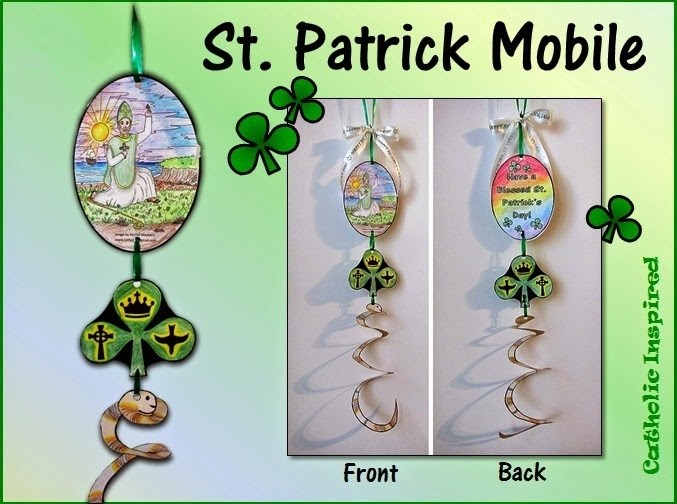 This St. Patrick Mobile is double sided so it can spin around and it will always look good. 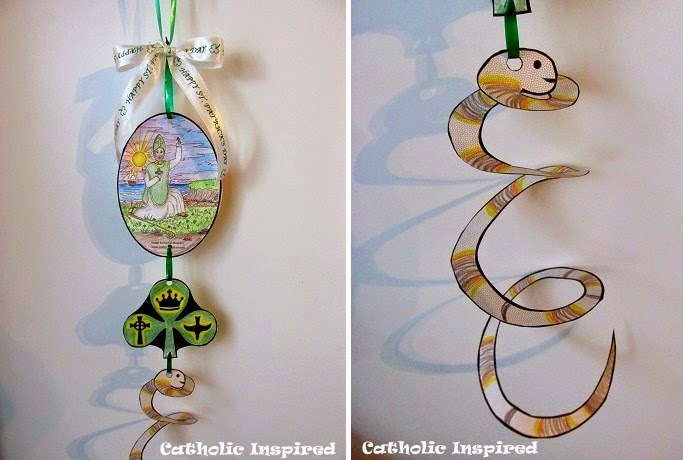 The swirly snake (a symbol of St. Patrick driving the snakes from Ireland) will dance as the mobile twists from the gentle breeze that is blowing through your windows! Download the printable from our Shop! for a single class or family! Your purchase helps support Catholic Inspired! After printing out the pages they will need colored. This is the fun creative part! 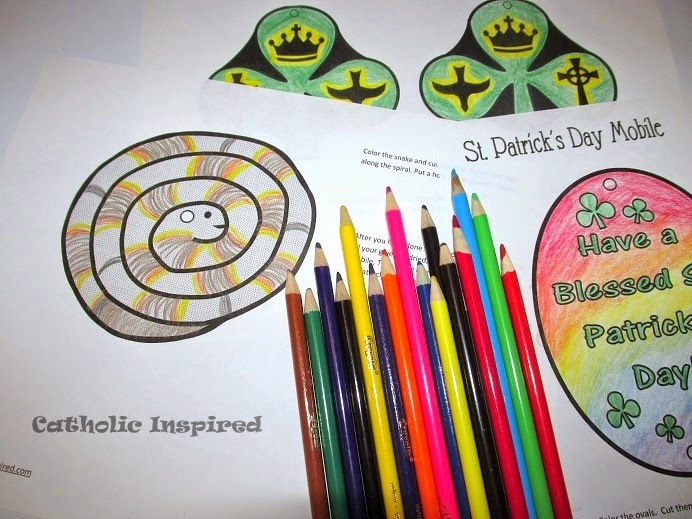 The children can color and decorate the pieces however they want. Color any design on the snake, too! 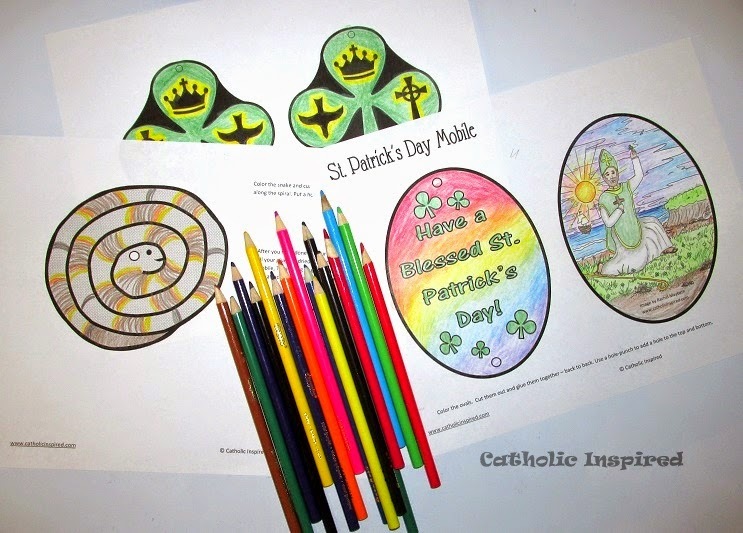 After coloring the pieces, cut them out. Also, I recommend that you color the back of the snake. This just looks a little nicer on the finished product. Now, cut along the spiral lines of the snake to make a coiled spring. Use the hole-punch to make a hole in the marked area on his head. Glue the two ovals - back to back. 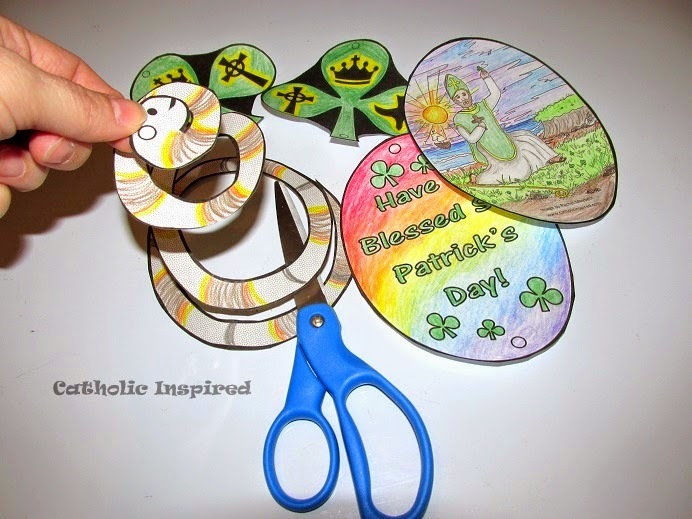 Then, glue the two Trinity clovers/shamrocks back to back. 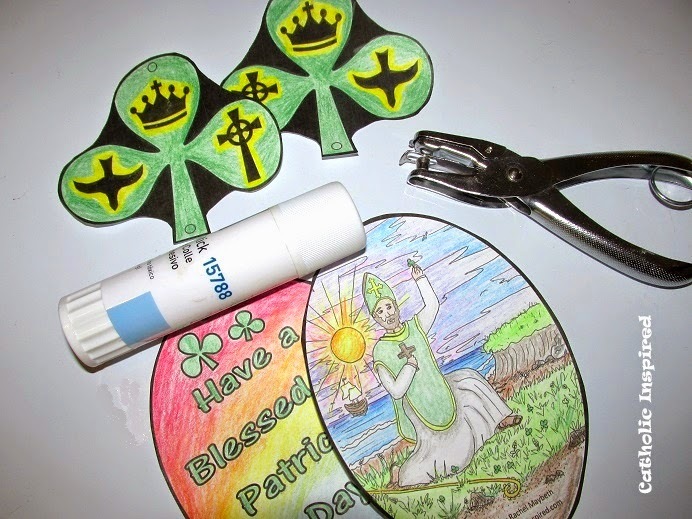 Use the hole-punch to add holes to the marked areas, on the top and bottom of each piece. Use your string/ribbon/yarn to attach all the parts together. Note: The pictures of our finished project show a white ribbon above the oval. This was just something we add, but it's not necessary for the project. Now, you have a two-sided mobile - Ready to spin in the March wind! 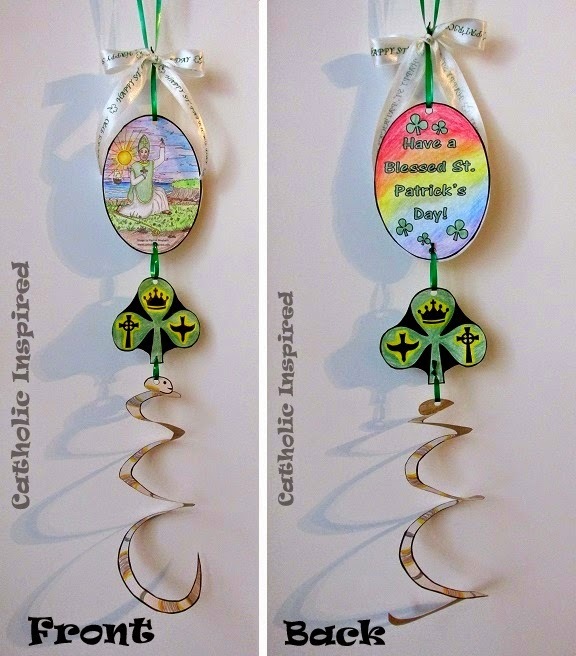 I also wanted to sent out a big "THANK YOU" to my daughter Rachel (pen name: Rachel Maybeth) for sharing her art work so I could make this craft! Rachel has her own art blog HERE. I'm sure she'd love for you to visit!